According to Malcolm Gladwell, behind the genius of high-achievers that leaves us awestruck is really just 10,000 hours of practice. Unless an earthquake brings this house down or you find yourself with a single parent, you will continue to have every opportunity to play. And even in the tightest straits we will sell the furniture before we touch your drums. Every hour on the set you’ll get to exchange for more options as an adult musician. Every hour brings your dreams that much closer within reach. You easily played for an hour-and-a-half when you were five. It is up to you whether you want to hit your 10,000 sooner or later than 24. But a good idea to develop your art as deeply as you can, find its place in our world before you settle down? Keep those two hours a day sacred and you will learn self-mastery, excellence, and your happier self. We know the more we love our music, the more we love it, right? Play your joy and never make excuses. I don’t want you to end up looking on as Joe blows smoke out of his set, saying “I could’ve done that.” He just practiced longer than you. This entry was posted in Arts, Kids, Learning, Music, Personal Growth and tagged Creativity, Education, Hope, Inspiration, Kids, Life, Music, Parenting, People, Success. Bookmark the permalink. Yes, I would love to talk about it some time. Tennyson, is it? Played for one and a half hours, (of meaningful music, We would presume) at the age of Five! That is Stupendous! And You parents ready to support him in his love, even till be reaches 24! That is LOVE indeed. Good to know about You All. Yes and yes. 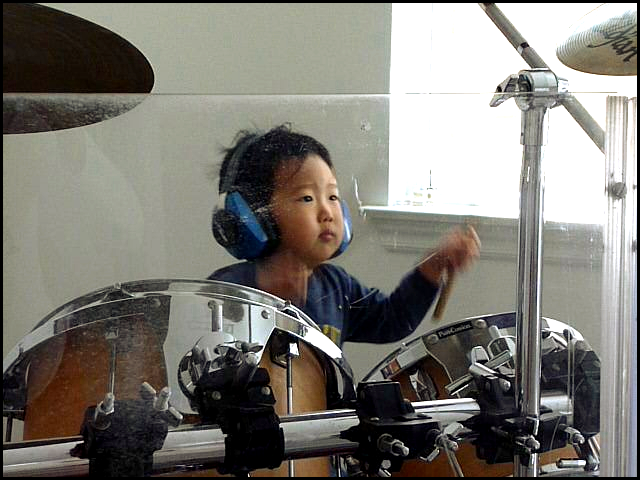 =) He’s practicing less as he gets older =( but still going strong and has his first concert next wk – playing the Beatles. Thank you for the thoughtful read. Yes, as he gets Older, he has more things to do, like maybe his Homework. That he is giving a Concert, at this Young and Tender age! I find that Amazing! Appreciate the generous regards, Swami. Any videos? That would be great to see. I know this post is from awhile back. Hope he’s still at it. Wow, I am impressed. I hope he continues to hold his interest in drumming. He could have a really good future, if he chose to pursue that as a career, but I would assume that he is equally bright in many subjects.